Like New, CRV SE AWD *** Rear View Camera, Bluetooth, Alloy Wheels *** One Owner, Only 27k Miles! 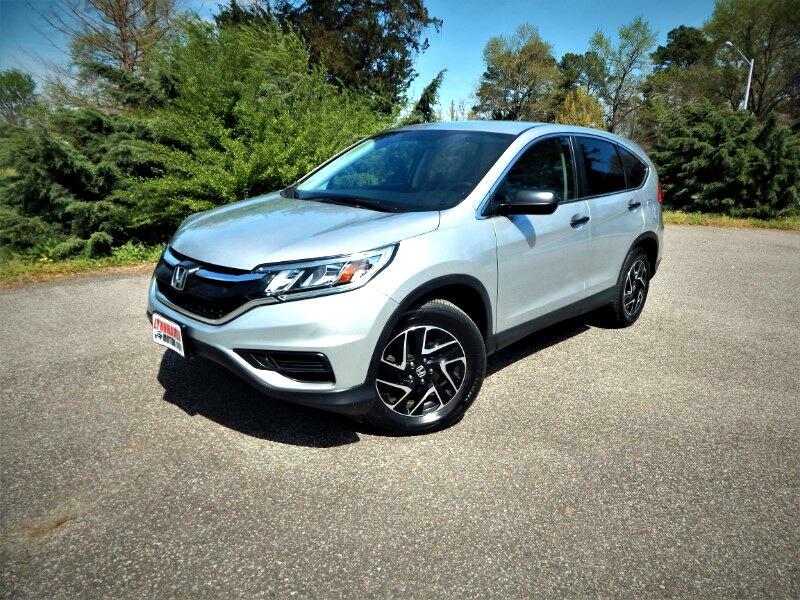 2016 Honda CR-V SE AWD, Rear Camera, Bluetooth, Alloy Wheels! Trim:SE AWD, Rear Camera, Bluetooth, Alloy Wheels! Like New, One Owner, CRV SE AWD, REAR VIEW CAMERA, BLUETOOTH, ALLOY WHEELS, Only 27k Miles, CARFAX / AUTOCHECK and STATE CERTIFIED with BUYBACK GUARANTEE, Automatic, Loaded w/ Power Options, STEERING AUDIO CONTROLS, MP3 SATELLITE RADIO COMPATIBLE, STILL UNDER FULLY TRANSFERABLE FACTORY DRIVETRAIN WARRANTY... the Honda CR-V trumps other used compact SUVs with its reviewer-praised nimble handling and roomy interior. It was named US News' Best Compact SUV for families when it debuted with this body style in 2014. Reviewers said the CR-V really stands out with its car-like ride and nimble handling, as well as easy maneuverability in tight quarters. The CR-V has among the best overall cargo capacity in the class, and test drivers were pleased with its abundance of small-item storage as well. Standard features in the 2016 Honda CR-V include Bluetooth, a rearview camera, Pandora Internet radio connectivity and a USB port. As a daily driver, the 2016 CR-V does almost everything exactly right and provides enough variety in terms of equipment to satisfy most mainstream buyers. Add an excellent track record for reliability and outstanding crash-test ratings, and it’s hard to go wrong with this Honda. As with any other of our vehicles, you may have this one pre-inspected by your trusted mechanic prior to purchase. We strive to only keep high quality vehicles with low mileage offered at the most competitive price. We are a family run independent Dealership with over 30 years of experience serving families, and our low overhead translates to lower prices for our customers. Each of our pre-owned certified vehicles goes through a 108 point check and Virginia residents receive a brand new State Inspection. Visit us online at www.lynnhavenmotors.com to see more pictures of this vehicle, or call us at 757-425-9300 today to schedule your test drive. Vehicle Inquiry for 2016 Honda CR-V SE AWD, Rear Camera, Bluetooth, Alloy Wheels! Trim: SE AWD, Rear Camera, Bluetooth, Alloy Wheels!